Registration point at G-Tower building. Venue of this year’s UNPOG Regional Symposium (Courtesy: Wonji Kim). 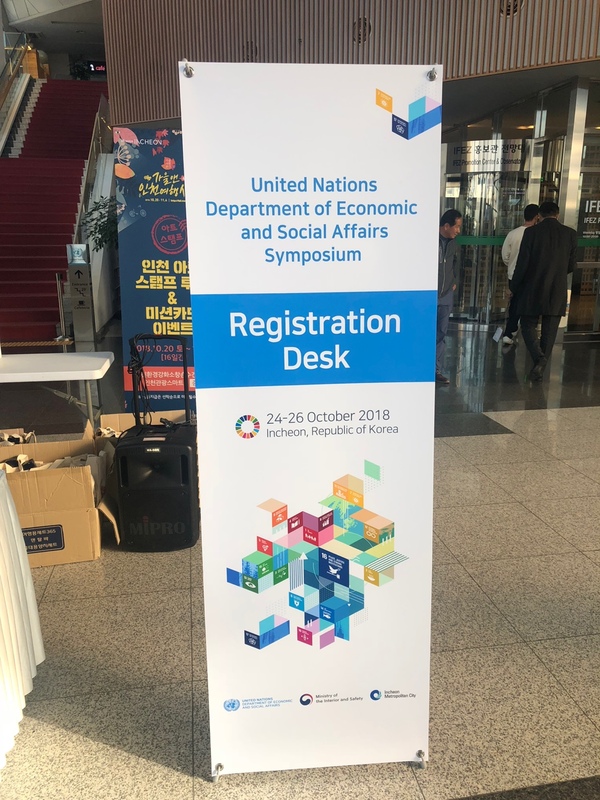 The United Nations’ regional symposium on “Strengthening the Capacities of Public Institutions and Developing Effective Partnership to Realize the 2030 Agenda for Sustainable Development” commenced today Wednesday 24th October, 2018. 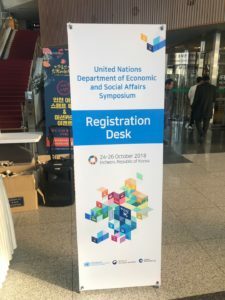 The three day event, scheduled to run from October 24th to 26th is organized by the United Nations Project Office on Governance (UNPOG) in Songdo; in conjunction with Incheon Metropolitan City, the United Nations Department of Economic and Social Affairs and South Korea’s Ministry of Interior and Safety. The venue of the regional symposium is the historic G-Tower building on 175, Art Center-daero, Yeonsu-gu, Songdo. Other plenary sessions including panel discussion, forums, round-table dialogue, Q&A opportunities as well as breakout sessions are staggered throughout the three-day event. Talks will focus on e-governance, Policy Implementation for SDG, Fourth Industrial Revolution, Citizen-government interface, women’s right, youth engagement, aging societies and poverty in underdeveloped regions of the planet. The concluding remarks and closing of the Symposium will take place on Friday 26th from 4.30 pm. Although registration and participation is by invitation only, UNPOG have given a special concession to students of the University of Utah Asia Campus to attend any plenary session, particularly on Friday. If interested, please pick up a participation form from Dr Jatula.